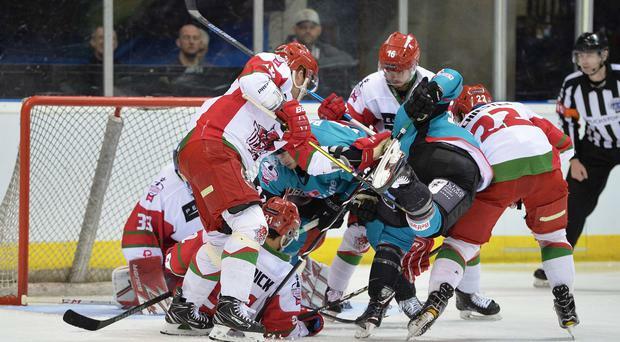 So near and yet so far for the Belfast Giants as their Grand Slam hopes came to a crushing end with defeat to the Cardiff Devils in the final of the Elite League play-offs. Having jousted all season at the top, the 2-1 game was settled with 7:33 remaining when Devils defenceman Gleason Fournier got the game-winner, breaking Giants hearts and handing Cardiff the perfect revenge for being pipped for the league title. The Giants had battled back from being a goal down early in the game, Devils winger Mike Hedden getting the opener 16:32 into the first period, with a goal from Kevin Raine tying it up for the Giants at 9:56 of the third. But Fournier's strike late on ensured it would be Cardiff who celebrated at the final buzzer, rather than the Giants completing a domestic clean sweep. Cardiff netminder was Ben Bowns dominant between the pipes, making 34 stops in a man of the match performance, leaving Giants head coach Adam Keefe devastated. "You can't take anything away from Cardiff, they're a great team and well-coached. Congratulations to them, they've been a good team all season and they were good tonight as well," admitted Keefe. "That said, I thought we had the better of the play and we deserved more. But we didn't get it and that's that. "It's not easy to say right now but it has been a successful season, and to fall a goal short of a Championship and a Grand Slam is a tough one to swallow. "You can't take anything away from those players in that room. Watch that third period back, you could see that desperation." It's still been a phenomenal season for an exceptional Giants roster, who won three of the five trophies they were in for and came agonisingly close in the final of the two they didn't. But it is a sour note for the season to end on, regardless, and with a good portion of the roster likely to depart for pastures new, it would have been a great way to finish what has been an outstanding campaign for the team. Indeed, the day started with confirmation that one of the roster would be hanging up the skates, centre Dustin Johner penning an emotional post on Twitter to announce his retirement. He took the opening face-off, and within minutes Belfast could have been ahead when leading scorer Darcy Murphy got a breakaway, only to be denied by the sprawling pad of Bowns. Murphy would be at the forefront of controversy shortly after, however, the winger shipping a heavy hit from Devils defenceman Drew Schiestel and having to leave the ice temporarily. Keefe and captain Blair Riley were incensed no call was made on the play, and that manifested in Belfast taking consecutive penalties as Kyle Baun (tripping) and Jordan Smotherman (interference) headed off. But despite the league's leading penalty kill succeeding, playing out the 5-on-3, Belfast soon found themselves behind. A blocked pass fell right to Hedden and, on the breakaway, he finished shortside on Giants netminder Tyler Beskorowany for the go-ahead goal at 16:32. Twice the Giants were denied by the frame of the goal after coming out for the second period, Patrick Dwyer pinging the right post on the powerplay before Colin Shields crashed one off the left post with a slapshot from the top of the right circle. The best chance fell to Smotherman, however, again on the powerplay as Mark Louis sat for tripping, but Bowns made a sublime glove stop from the winger after he got a one-timer away following a reverse pass across the crease from Baun. That seemed to be an indication that the day wouldn't belong to the Giants, and when they passed up a fifth opportunity on the powerplay with Matt Pope off for interference, that too seemed to be an indication. But from the most unlikely of sources, they drew level. Defenceman Kevin Raine with the shot that finally beat Bowns at 10:03 of the third period, tying it up and setting up a nervy finish. That just led to the heartbreak of Fournier's winner. The defenceman was dished the backhand pass by Pope on the breakaway and he controlled nicely to beat Beskorowany five-hole for the game-winner, crushing those earnest Grand Slam dreams. Still, three out of five ain't bad.